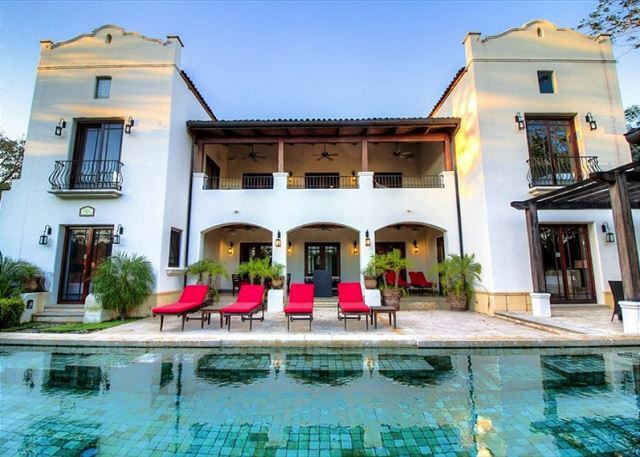 Casa Orchidea, named after Costa Rica’s national flower, is a beautiful Spanish-style mansion that accommodates up to 13 guests. This exquisite vacation rental home is located inside of Hacienda Pinilla, Costa Rica’s premier gated community, fifteen minutes from the famous resort town of Tamarindo. 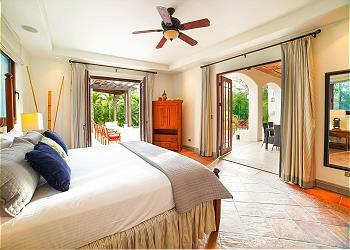 You won’t find a better place to spend your tropical vacation than in the beauty and the serenity of Casa Orchidea. Two floors, 6 bedrooms, 4 baths and 2 half-baths, a full kitchen on the ground floor and a wet bar on the second, a balcony, a terrace, an infinity pool and pergola are all pieces of the puzzle that come together at Casa Orchidea to make it your dream destination. One of the best things about Casa Orchidea, and a reason it is always a favorite, is that the natural hegde of palm and hibiscus that surrounds the property makes the garden areas completely private. 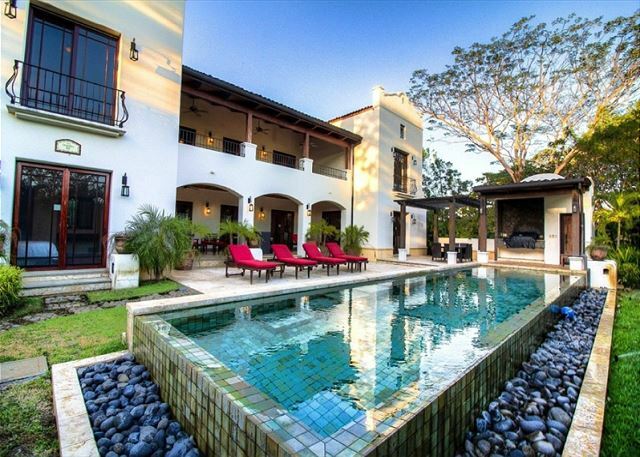 Enjoy the terraces and the pool as if all of Hacienda Pinilla were your own. Early mornings and late afternoons are excellent times to spot colorful birds and butterflies at Casa Orchidea, and you never know when a Howler Monkey troupe may decide to come pay a visit. A new gas grill and an outdoor dining table in the pergola by the pool provide a place where you can prepare and enjoy outdoor meals, or let us bring in a private chef to do the work for you. The first and second level terraces are the perfect place to start the day with a cup of locally-grown coffee while our staff prepares your breakfast every day except Sundays and Holidays. 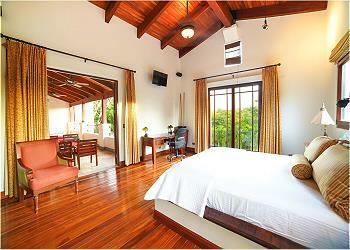 Each floor at Casa Orchidea is comprised of a great room and three private bedrooms. On the ground level, the spacious common area is where you will find the fully-equipped kitchen that is at the heart of every truly wonderful home. 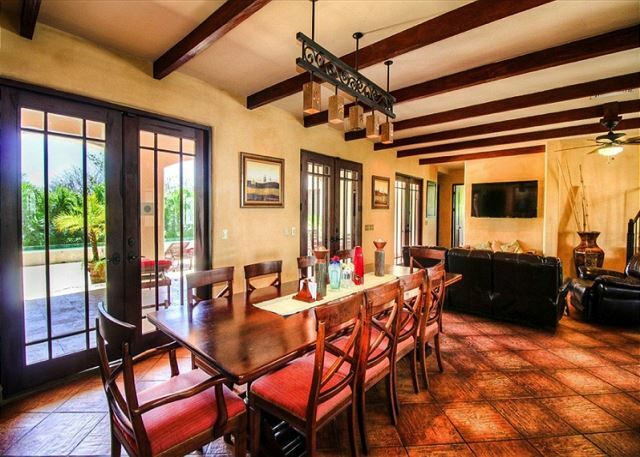 The dining area and a comfortable TV corner are all part of this open space that flows, through multiple sets of glass doors, onto the patio, the sun terrace by the pool, and the lawn. Upstairs on the second level of this luxury villa, meticulously-maintained hardwood floors span the home end-to-end. Two sitting areas--one with a large flat-screen TV--and a professionally-arranged wet bar are yours to enjoy. On breezy evenings, open the glass doors to the generous balcony and enjoy the fresh air as you lay back in the hammock or on the cushioned loungers. 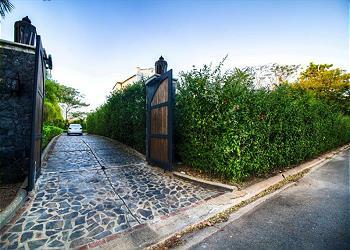 Five of Casa Orchidea’s spacious bedrooms are furnished with king sized beds, and one of the rooms contains two twin beds and a daybed that comfortably accommodates a child or small adult. The master bedroom on each floor contains an en-suite bath, and the other two bedrooms on each floor share a full bath. 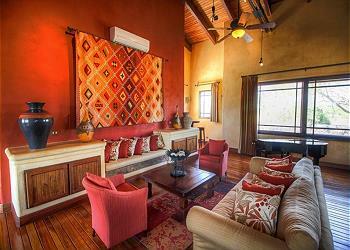 Each room has its own air conditioner. 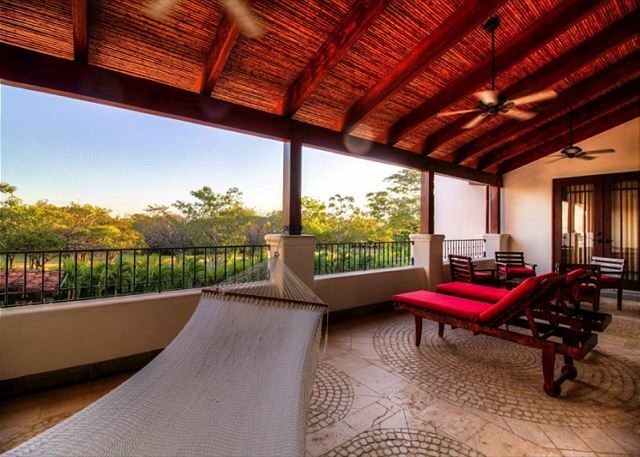 A full list of amenities comes with your vacation at Casa Orchidea. First of all, in-home amenities include air conditioning, wi-fi, housekeeping service during your stay of 4 nights or more, daily breakfast-preparation, and all the tips and insights we provide to you through our 5-star Concierge service. Vehicle rentals, tours, private transfers in our new vans, and additional treats like in-home massages or chef services are just the beginning of what our Concierge can arrange for you. 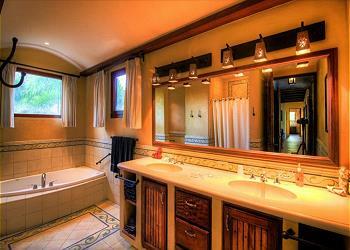 And then there are the Hacienda Pinilla amenities. Hacienda Pinilla is a 4,500 acre nature preserve that lies along 3 miles of pristine Pacific coast line. Stroll, swim, you prefer. The Las Golondrinas community where Casa Orchidea is located borders the ocean, so a quick drive through the community or a walk of about 10 minutes will put your toes in the sand. Casa Orchidea was perfect for our large and unwieldy family ranging in age from 1 to 80. With three toddlers and three teenagers to please, we found lots of options for relaxation and activity, and we had great spaces in the house to hang out together. The pool was lovely, and so was the beach club at Hacienda Pinilla. Those of us who too day trips, found the travel time a bit too long, however. We especially enjoyed the lovely breakfasts cooked by our wonderful housekeeper Delma, and the dinners cooked for us by the catering company recommended by the management company. We rented the house for a long weekend. MY wife, children and a few of their friends. The house was beautiful, well-mantained and perfect for a large group/family. We will defintely be renting it again. The extras ie. daily maid service, private concierge by email made it an even better rental. Thank you Michael! We are happy to hear you, your family and friends had an amazing time and could enjoy all the house amenities. Let us know next time you are visiting as we will be happy to assist you once again :-) Pura Vida!! We stayed at Casa Orchidea for a week and had the most fabulous vacation! The house and yard are gorgeous, the property was very clean and well-kept. The rooms had plenty of space, the beds were SUPER comfortable, and the living spaces were big enough to accommodate our large group! The housekeeper was a huge bonus and was the sweetest woman ever. Will definitely be returning!!! Hi Katie, Thanks for sharing your experience at Casa Orchidea. 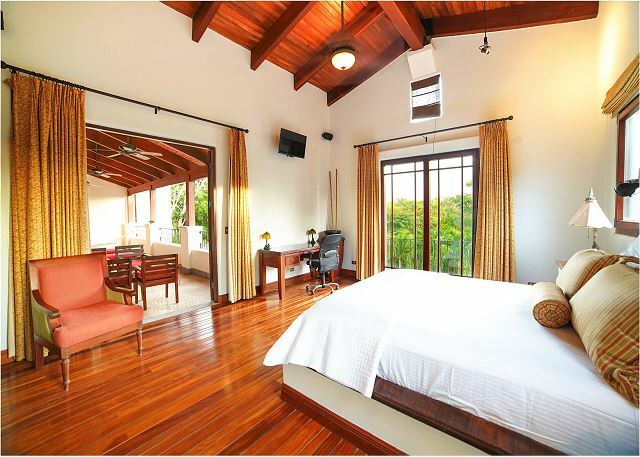 We feel very proud to know you had a fabulous vacation and you found this property gorgeous, comfortable and well-kept. We are really looking forward to your next visit. At your service! 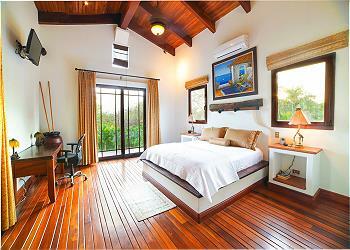 We knew that a stay in Tamarindo would be the best company to go with. Casa Orchidea was absolutely perfect. Could not have been a better home for our family vacation. The home was pristine, yet comfortable. Each room was thoughtfully designed and cozy. 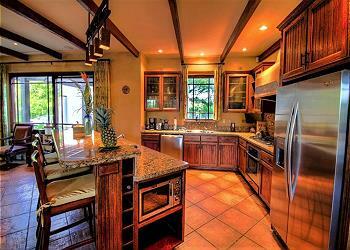 The kitchen was gorgeous and fully functional, and the pool area and backyard were simply sublime. Hi Gina, Thanks so much for your comments. We are so proud to know you loved Stay In Tamarindo services and found Casa Orchidea as a perfect Vacation Rental for you and your family. Your comments are well appreciated. Thank you for giving us the opportunity to offer you a pleasant and very enjoyable vacation. Pura Vida! A friend recommended contacting Stay in Tamarindo to rent Casa Orchidea. This was the best rental we've ever experienced. The house was an unbelievable 7000 square foot home with 2 master bedrooms, one on each floor and 4 other bedrooms and 3 bathrooms Two family rooms - nice kitchen with bar height counter and stools--and a dining room table to fit 12. It perfectly accommodated our family. Plus we had Maura, our housekeeper, who made our breakfasts, cleaned up, did our wash and made the beds. Any requests we had from the management company was handled immediately. 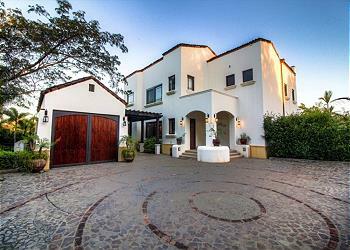 We highly recommend this beautiful home to rent. Hi Joyce, We feel very proud to know you loved everything about our rental and services. Your nice words are well appreciated. Thank you for giving us the opportunity to offer you a pleasant and very enjoyable vacation. We hope you stay with us again sometime soon. Pura Vida! Very relaxing. The pool was the least favorite. Marula was fabulous! Hi LaTonya, glad to know you had a very relaxing time during your vacation! Maura is amazing :) Thank you for staying with us! My extended family had a wonderful vacation at Casa Orchidea. 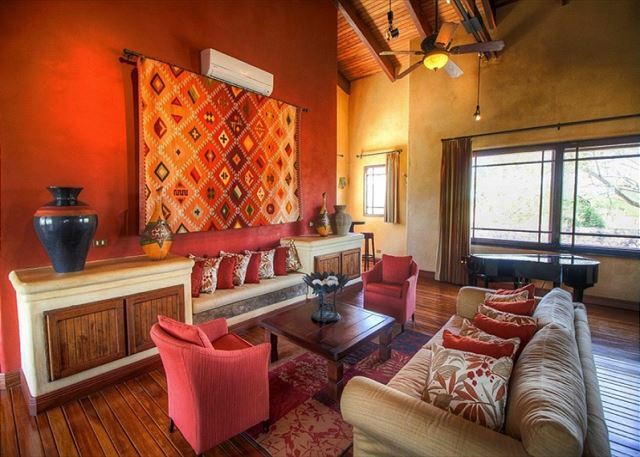 The place was fabulous within the Hacienda Pinilla community. 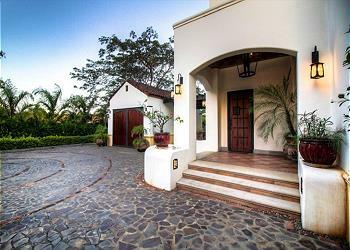 It offered a quiet, peaceful location in a gated community just minutes from Tamarindo. Leo, So glad to hear you and your family had a memorable time in Casa Orchidea and the area in general. Let us know when you are coming back to Costa Rica, we will love to assist you! Our family of 13 went to Costa Rica to celebrate my in-law's 50th wedding anniversary. The house was spacious and perfect for our family to enjoy and we had plenty of room for everyone. Maura the housekeeper was wonderful and attentive. The entire staff at Stay in Tamarindo were fabulous to work with and helped to make our vacation unforgettable. We enjoyed several activities - ATV tour, Canopy tour, Private Catamaran and Safari tour and we enjoyed them all! We also enjoyed relaxing by the pool at the house and at the Beach Club. We had the catering company prepare dinner one night at the house and also ate at the Beach Club, JW Marriott and at Patagonia in Tamarindo. We felt very safe in the gated community of Hacienda Panilla and appreciated the warm welcome that the people of Costa Rica gave us. It was a wonderful week and we would love to return!! Hi Michelle, thank you very much for your kind review and your positive comments. We are happy to hear that you have enjoyed your time in Casa Orchidea and could enjoy the many tours and activities in the area. So glad you meet really nice people and you had a wonderful week. Let us know when you are coming back to sunny Costa Rica, we will love to assist you. All the best! What a great place. 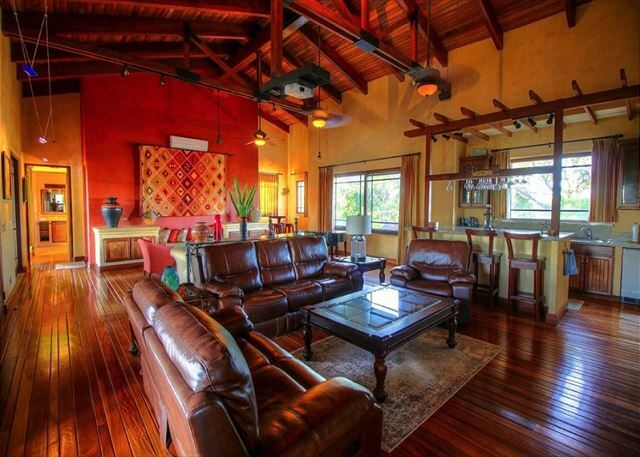 The home is beautiful and Hacienda Pinilla is an amazing community. We loved the great room upstairs and the kids had all the space the needed. The home is a 3 minute walk to the beach where at low tide you find the biggest tidepool ever. You can snorkel in it. Maura who cares for the house is very sweet and attentive. Having someone to clean up and help made the vacation so much better. Nearby we loved dining at the JW. Marriott, 2 min away, Our favorite Restaurants were Tamarinds at the JW and Pangas in Tamarindo. The Stay in Tamarindo folks were great as well. They helped us with every question or concern we had. I would use this company again for sure. We did a few tours with Edwin and went fishing on Pargo ***** with Captain Charlie. I highly recommend both. Fresh wahoo for Dinner. The beach club at Hacienda Pinilla is a great place for the family to hang out as well. It is about 5 minutes from the home. Really good surf there. Then the other direction is a beach called langosta about 5 minutes in the other direction. Super private and beautiful. If you hunt around inside Pinilla you can find several empty beaches. This place is very private and we saw tons of wildlife. Little central american deer run through the communities and the monkeys seem to be everywhere. I love this place. We had a very nice stay at Casa Orchidea! 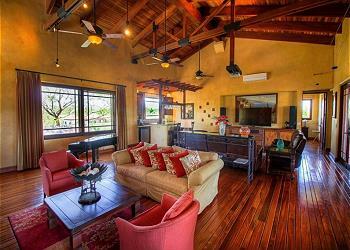 The house is spacious and accommodated our group of adults and children. There is a great entertainment space upstairs, but we never used it, as we preferred to enjoy the beautiful evenings outside. The outdoor spaces were amazing...nice lounge chairs, plenty of different seating spaces. The pool was perfect for the kids...they were often swimming at 7:30 am. It's a short walk to the beach, where we enjoyed the sunset. Overall, we were disappointed in the Hacienda Pinilla golf course. They never water it in the dry season, and it was in bad shape. The area is somewhat desolate. It would be a great spot if development takes off in the next few years. We were unprepared for the fact that only 11 of the 75 lots in the Las Golondrinas neighborhood have houses built on them. The other neighborhoods are in a similar situation. Overall, we would return to this home if the development starts to grow again. One of our best experiences in Costa Rica! We love Costa Rica! We have been visiting for the past 5 years and have stayed all over the place, from Dominical all the way to Arenal. This time we decided to go to Tamarindo! 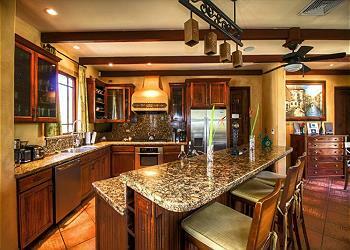 The community where the house is located has access to a beautiful Beach Club at just a few minutes from the house. We were also lucky enough to be able to visit the JW Marriott during one of our days and enjoy their amenities next to the beach. There's a beautiful beach called Playa Mansita, close to the Marriott with access to anyone staying inside Hacienda Pinilla, we loved it down there! Casa Orchidea was absolutely spotless. The bedrooms are very comfortable and large. King beds on every bedroom. A large balcony overlooking the backyard and the pool. And the lounge area at the pool was fantastic! We enjoyed several nights of BBQ late at night. We will definitely stay again here in the future! Thank you Jeff! Sounds like you had an amazing time in Casa Orchidea and really got to enjoy what this area offers! :-) Thank you again for staying with us and hope you can come back very soon!! First time we have done this; based on Casa Orchidea we will definitely do it again. The house was spacious, comfortable, and as good as advertised. Concierge, guest coordinator, housekeeper, and catered food service were all A-One excellent. House and grounds clean and lovely. Would highly recommend. Loretta, so happy to hear you had a great time in Casa Orchidea! It was our pleasure to assist you during your stay and hope you come back to Costa Rica very soon! We stayed at Casas Orchidea in March and found a beautiful Colonial home in a 5000 acre Hacienda. We were awakened by Howler Monkeys every morning and saw parrots, monkeys, deer, brahma cattle and even a coyote. Inside 2 guarded gates we always felt secure. The house is Amazing and actually looks like the photos. The attention to detail makes for a truly luxury experience. 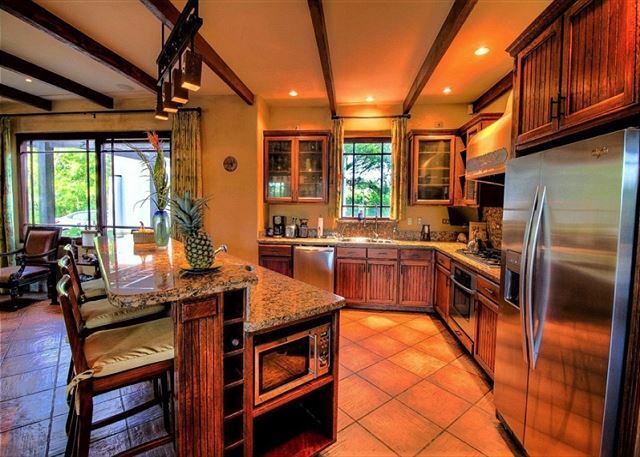 The Hacienda has every activity within its secure boundary as well as 6 restaurants for a variety of choices when you choose to not use the most complete kitchen we have found in a vacation rental. We really enjoyed the beautiful pool and terraces and hammock. The house has several large social areas for our group with A/C in every room. There are 2 large TV's in the living room and great room upstairs as well as speakers everywhere to hear you favorite playlist. There is an upstairs bar perfect for hosting your event. Located just 3 lots from the beach path you will find an uninhabited beach with lava pools for snorkeling at high tide. Or walk 3 minutes down the beach and you will find a nice seating area to watch the beautiful sunset with a glass of wine. 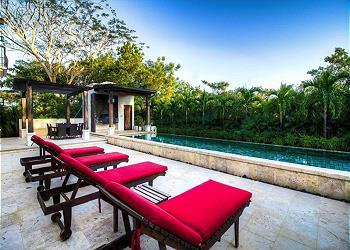 Casa Orquidea is quite possibly the finest vacation rental we have found and the combination of Casa Orquidea's location, security, and proximity to activities and COSTA RICA will provide long lasting memories of an exceptional vacation. Casa Orchidea was the perfect choice for our family! It is a very warm and inviting home in a charming and quiet neighborhood with lovely private landscaping for lounging around the pool area. Best of all it is only about a minutes walk to a private beach! The Stay in Tamarindo team were a pleasure to work with from making our reservation through to booking our activities & tours! We would definitely stay here again and recommend it highly to anyone looking for a home away from home! 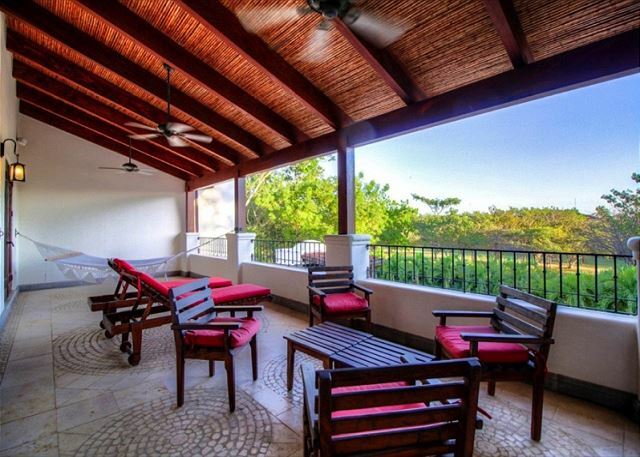 Other perks that we loved: the beach club is stunning, great 18 hole golf course and the Hacienda Pinilla neighborhood is close enough to Tamarindo for easy access to the shops and restaurants but far enough away to really feel like you are on vacation!